Two nooses were found in Brooklyn in two weeks, a councilman said, raising concerns about hate crimes. Councilman Robert E. Cornegy Jr. spoke Sunday about the nooses and safety concerns due to hate crimes. "Not long ago it was illegal to educate a black person," Cornegy said. "We're saying it's in front of a library but across the street is an elementary school, so what's he suttle message there." 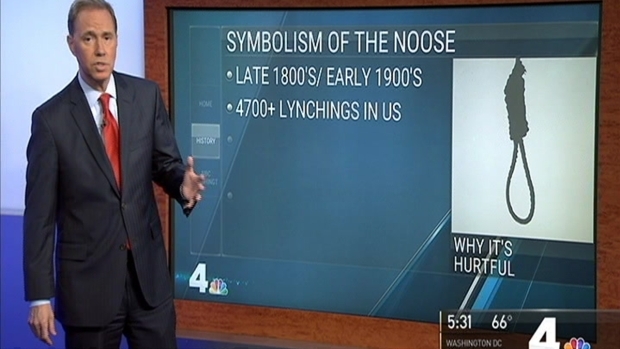 The first noose was found Monday hanging from a tree next to the Brooklyn Museum. Police said they didn't have information about it. The second was found Thursday outside of a library in Bedford Stuyvesant, police said. A custodian found the 6-foot white rope, removed it and gave it to security. No notes or other symbols were discovered with the noose. The NYPD's hate crimes unit is investigating.